We all know that sugar is not good for our health but how often do we get attracted to sweet things… sweet drinks, cakes, muffins, cookies, indian sweets. It is so difficult to resist the very things that are bad for our health. I have tried substituting sugar with the artificial sweeteners but can’t stand the bitter after taste. And then all this confusion about artificial sweeteners not being good for us.There is a lot of rave about stevia, but have not used it as such. Its difficult to get it here so will wait to buy some during my next trip abroad. My bookmarked, untried written recipes and also from other blogs are just piling up and every time I try one, another one gets added. It seems the list is never going to end. 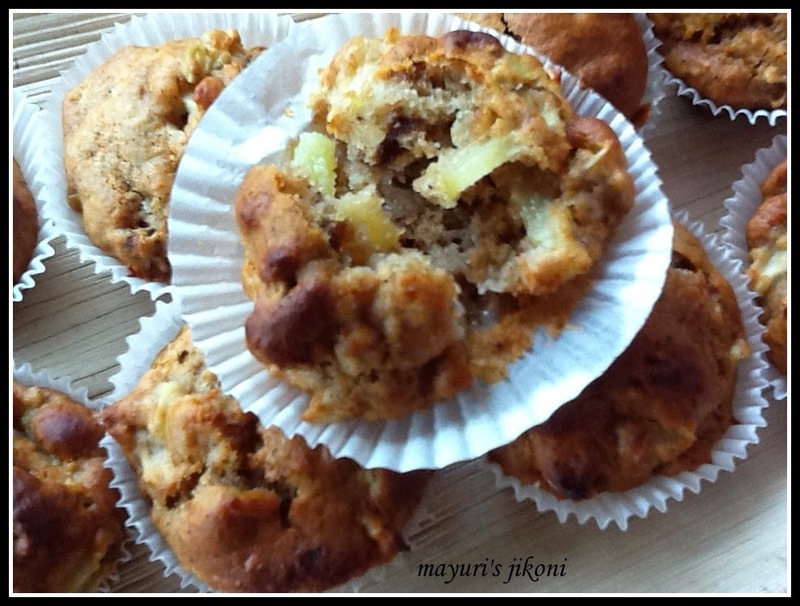 One of the written recipes was a recipe for eggless apple and date muffins. I must have got the recipe from a magazine but cannot remember. What caught my attention was that to sweeten the muffins,honey or maple syrup was used along with dates. Though honey contains more calories as opposed to sugar, the benefit of consuming honey is that it provides nutritional benefits because it contains minerals and vitamins. Sugar does not contain any of these things. Honey is sweeter than sugar so less honey is required compared to sugar. Maple syrup comes from the sweet sap of maple trees. Like honey its high in calories but contains beneficial minerals and oxidants. Preheat the oven to 180°C. Line muffin tray or cups with paper cups. Mix the chopped dates, walnuts and apples with a tbsp of flour. Keep on the side till required. Sift flour, baking powder, soda bicarbonate, salt and cinnamon powder together in a bowl. In another bowl add honey, yogurt, oil, vinegar and vanilla extract. Whisk the mixture till it is nice and frothy. Add the apple mixture to the flour and mix well. Add the honey mixture to the flour mixture. Mix just till the flour is wet. Do not over mix. Spoon the batter into the prepared muffin tray or cups three quarter full. Bake in the oven for 15 to 20 minutes or till the tops are light golden brown. I did not peel the apple. Use any apple of your choice. Add chopped chocolate if you like.